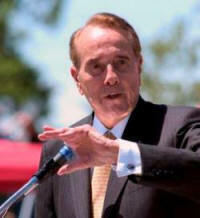 Kansas Senator Bob Dole was keynote speaker for the dedication ceremony. 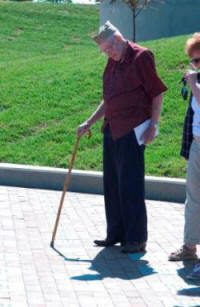 A Veteran reads the inscriptions on the mahogany granite pavers. The pavers, purchased by family and friends, total more than 2,750. 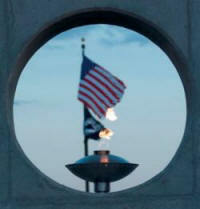 Proceeds from the sale of the pavers support the on-going maintenance of the memorial. Above: Bronze sculpture by Wichita artist Constance Ernatt entitled "Peace and Tranquility" features a sculpture of the world with doves encircling it. 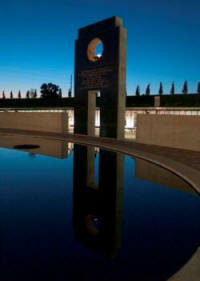 The Eternal Flame, left, represents the values of selfless service and sacrifice, is centered prominently in a 4-ft. diameter circular window of the Monumental Arch (above). The Arch overlooks a 40x60 foot oval reflecting pool. The 12-ft wide, 21-ft. 8-in. tall Monument Arch (above) is the dominant feature of the memorial. Above: The 300-ft. "Moving Wall" was refurbished by John Devitt, who donated it to the university for permanent display at the PSU Veterans Memorials. The wall is made of porcelain-enameled steel panels with inscribed names. An aerial shot of the Pittsburg State Veterans Memorial shows off its enormous size. All photographs by Malcolm Turner, PSU photographer.